The Great Blizzard of 1888 affected metropolitan New York from March 10th to March 14th. The resulting transportation crisis led to the creation of the New York subway and furthered the art of weather prediction into a science. According to the weather bureau at the time, NY expected slight rain was expected and not the White Hurricane that blanketed the city. Theodore Roosevelt did not lose the election for the Mayor of New York the year before; certainly his leadership experience might have changed the eventual annexation of the Philippines more than 10 years later. My memory visits 1888 when Rizal came to New York. 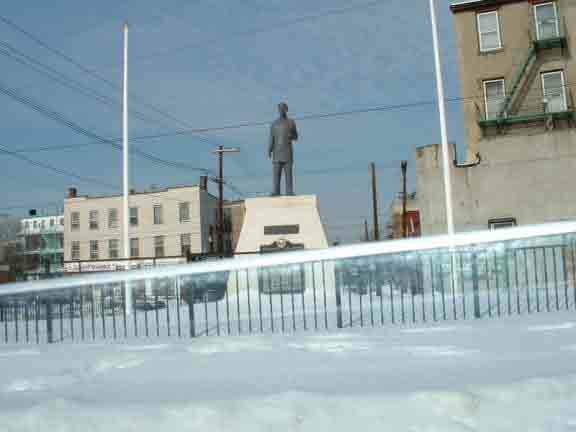 Had he came just two months earlier I would have lent him my down jacket had he forgotten his overcoat (if you don’t remember, come see his monument in Jersey City or in Cherry Hill, New Jersey.) That was the last time when a sitting president was elected President of the US with out the majority of the popular vote (before George W. Bush, of course.) Just of one of the similarities of 1888 and 2003. Where was the great Mark Twain during the blizzard? He was in New York, angry because his lucrative speaking engagement was cancelled. He could not speak against the war in the Philippines, as the troops had not yet landed in Manila. Mark Twain had become a favorite commencement speaker, often criticizing the American role in the Philippines. You could see college graduates turning their backs at him during the ceremonies. Theodore Roosevelt became the only president who won both a Medal of Honor and a Nobel Peace Prize. He refused to attend college graduations where he would have to shake hands with Mark Twain. Yesterday, students organized their opposition to the war in Iraq. What I am sure, their cause might be closer to the truth than most critics of war. It is not because of Oil below ground and it was never was. It is the high ground and I don’t always believe in crusade, political or otherwise. For a change, the students were worried that military cost would be siphoned from educational funding. They are right, even if I don’t agree that money is the only cause of the failure of the educational system in this country. The return of the Draft is being recycled amongst students but there is nothing to fear. I have never seen our military volunteers in much higher morale until now and they are capable. Maybe I am partial and very proud when Captain Jose Corpus was acting commander battle group going on deployment to the Persian Gulf. As the Acting Carrier Group 5 (Kitty Hawk) commander, Captain Jose Corpus was now responsible for 10 ships and nine air wing squadrons, comprising the largest battle group in the Navy and the only permanently forward-deployed battle group. I don’t even think that President Roosevelt, the father of the US navy ever thought when he sent the great white fleet to the Pacific. The North Korean just recently tested the vacuum created by the re-deployment of Captain Corpus Group from Japan to Iraq by provoking plane conducting recon flight between Korea and Japan. Another battle group (USS Carl Vinson) is underway within the striking distance of Korea to take his place in today’s mobile Navy . "MAMA, please pray for us. We're being sent to war." highest-ranking Filipino-American in the US Army. always fear for their safety." assigned at the MSS Missouri. "I will just pray hard for the safety of my son"
Middle East during the 1991 Gulf War, she said. ago. "I even told him that I might die ahead of him." boys and five girls -- asked her to do. the safety of her son. in the US naval base in Subic, west of Manila. "As a mother, I am really worried. But what can I do? It's a call of duty," Suarez said. of absence, but "he did not obey me," she said. when her son came home for a vacation. "He is brave. It's part of his job," she said.